Kagome is a popular style element in temari-making, but can also be a very confusing one. It's also one of the more tricky ones to learn from the books. Kagome is usually composed of maki kagari, but the bands are laid down in a particular way so that the weave is continuous around the entire pattern (either the entire temari or within a section of the design), with no breaks in the patterns. Done properly, there is no beginning or end. 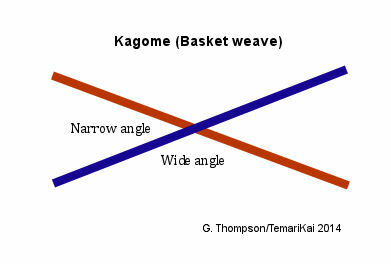 The bands of kagome are usually laid down in some combined orientation on the off-set of pentagons in the 10-combination division. Many variations exist, of course but once established the pattern orientation needs to be maintained, There will be a common crossing sector, and this is what needs to be focused on. Once intersecting bands begin, there is a common cross over that emerges. Think of it as an elongated, sidewise "X". The thread or band coming down from the upper left ALWAYS crosses UNDER the thread or band coming down from the upper right. If this rule is adhered to, the pattern will emerge as planned with all of the crossovers (no matter how many of them!) perfect - no misses, no stops or starts. This is a teaching ball made to show the intersections/crossovers. It is wrapped with ribbon rather that maki kagari, since it's a bit easier to follow and it might help to make a learning ball in this manner. Crossover 1 corresponds to the main diagram above. 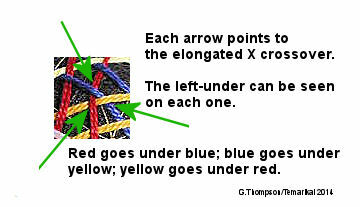 The yellow band from the left crosses under the green band from the right. Crossovers 2-5 likewise follow; move counter-clockwise to 2 and look "in" towards 1; it's the same for the remaining intersections. Taking a closer look at the more intricate application from above, if one triple intersection is examined, you can see that it's made up of 3 of the standard crossovers. This is a TemariKai.com Printable Page; © 2014, all rights reserved. Right click to print one copy for personal use. Last updated 1/2014 © 1998 - 2014 TemariKai.com, G. Thompson/PuffinStuff, Inc.